Technically impressive if overly technical, with more content, tutorials and a bit of polish, this package could really shine. Incredibly versatile. Hosts VST plug-ins. Powerful expression editor. Complex and technical. Not beginner-friendly. You can't create standalone plug-ins. They say that first impressions count, and the graphical interface of the Studio Units Plug-in Collection lets it down on that front. We're not sure about the slate texture, for example, and the primary colour scheme reminds us of plug-in design circa 1998 rather than 2010. But the functionality behind the GUI is very much 21st century, and can be approached from two directions. Firstly, there's a library of 11 VST effects plug-ins that can be inserted into your own projects just like any other. These range from compression and equalisation through to filtering and vocoding - we'll have more details shortly. They sound good, and the manual goes into plenty of detail on how to get the most out of them. They're not going to rival dedicated high-end plug-ins, but that's OK - they won't be the reason you buy Studio Units. The real power lies in the prosaically named 'SU synth' and 'SU effect' VST plug-ins. These are portals to an underworld of sound design, audio manipulation and synth creation. They allow you to build sound processing patches in the Studio Units modular environment, and alongside the standard stereo versions, there are alternatives that can handle 4, 8, 16 and 32 channels, if your host is up to the task. Each offers an empty window of opportunity, where a patch can be created from scratch using a range of bundled modules. A clunky point-and-click interface opens a module and preset browser. Studio Units takes the same modular paradigm used by industry stalwarts like Reaktor and Max/MSP. Each of its integrated modules has MIDI, audio and parameter nodes, coloured red, blue and green, and these can be dragged to the inputs and outputs of other modules to connect them. The GUI displays these connections very effectively with nicely anti-aliased cables, and even when the patch gets complicated, you can usually find your way around the routing without too much difficulty. Studio Units does all this in real time, which aids immediacy and tempts you into making fine adjustments you might otherwise leave alone. Understanding how to combine the building blocks is difficult, however. You won't find oscillators, LFOs and envelopes, and you won't find the inputs and outputs labelled as you would with Reaktor or SynthEdit. Instead, you'll find modules more familiar to programmers and synth enthusiasts; and - the biggest hurdle of all - there's a seriously steep learning curve. 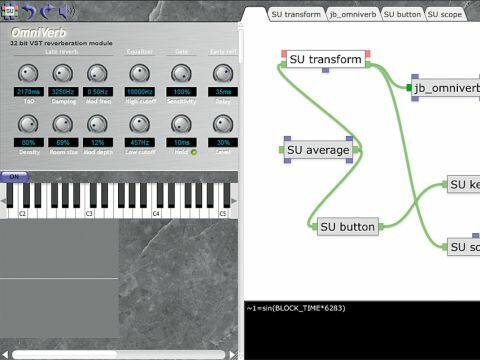 "Studio Units takes the same modular paradigm used by industry stalwarts like Reaktor and Max/MSP." The trouble is that generating sound isn't purely drag and drop - it also involves some programming. Many of the modules feature a small 'blackboard' area that's used to hold mathematical expressions describing their function, and each module's capabilities are far from intuitive. The scariest example of this is the 'transform' module, an immensely complex beast that's mostly used to generate sound. It features over 40 separate mathematical functions, the list of which reads like a primer in applied mathematics. If you do have a background in maths or programming, creating expressions isn't really difficult, but it can dampen the mood for spontaneous creativity. We would have liked features such as code completion, a common library of expressions or in-line documentation. As it is, you spend too long poring over a module's documented capabilities while making small changes to the expression. It's a little like message boxes in Max/MSP, where you define their function from a series of keywords, only the keywords aren't that easily visible and their parameters don't automatically appear. Thankfully, it's not all high-brow scientific tinkering, as there are also some surprisingly immediate modules. SU Valve, for example, emulates the harmonic distortion of valve equipment, and you can easily pipe audio into and out of it without resorting to expressions. It's the same with the immense IIR Filterbank, a powerhouse of sublime filtering possibilities. And one of Studio Units' best features is that, as well as being a VST plug-in itself, it can load other VST plug-ins as modules within the setup, opening up all kinds of possibilities. It's also relatively easy to tie controls to faders, knobs, buttons and even a piano keyboard, all of which are included as modules. The 11 bundled effects fall into the esoteric category, offering variations on filtering and analogue emulation. There's a 10-band twin-tube vocoder, for example, which can create extreme equalised and resonant effects, with or without plenty of round, tube-like saturation. Another favourite is a low-pass filter attached to an envelope follower. This does a great job of adding lush, warm sweeps to rhythmic material. In a similar vein, the transient controller makes it easy to dial in ducked separation to your breaks and beats, and there's an excellent delay with nine bands of equalisation. Alongside all of these, you'll also find a handful of analogue-apeing EQ and compression effects. The Mastering Equaliser is particularly impressive, although, like some of the other effects, it can add latency (almost a second's worth in this particular case) with the Mastering Equaliser. No problem for offline use, but it's an important consideration if you like to work live. We would have liked to see more presets for the effects - some creations, like the delay equaliser, have plenty, while others have none. All of these effects can be loaded into the main SU synth/effect editing environment, where you can pop the hood off them and examine their inner workings. Studio Units is a difficult application to summarise. It's complex, comprehensive and confounding. If you have the time, patience and ability, you can achieve almost anything via its austere, slate-textured windows and mind-blowing expressions editor. But unlike Max/MSP and Reaktor, it isn't a package that warrants the asking price for its presets alone (though granted it is a lot more affordable than those two apps), and beginner's guides don't exist. Maybe 12 months of user-created content will change things, but at the moment, to get the most from Studio Units, you will need to delve into the editor and create your own patches, which may be enough to deter most.